Prada is bringing high school teenagers into the realm of high fashion, introducing the class of the Prada pre-fall 2015 collection to the Italian luxury brand’s amazing designs. Of course, it appears as if Prada is creating a whole new brand of uniforms for these chic young ladies with their terrible hairstyles and freakish shoes that are a combination of tread-soled duck-shoes, trainers and brogues. And then there is Prada’s gorgeous but sober pleated pinafore dresses and utilitarian-classic coats which are the brainchildren of Miuccia Prada, granddaughter of founder father Mario Prada in 1913. With the women’s ready-to-wear fashion available since their launch in 1989, the Prada designs became known for their dropped waistlines and narrow belts, clean lines, opulent fabrics and basic colors. The anti-snobbish behaviour of the brand shot it up through the roof in the 1990s, when Prada’s originality made it one of the most influential fashion houses, its focus on the working class turning it into a premium status symbol throughout the decade. Now, the Prada pre-fall 2015 collection comes with normal, useful pieces in unflashy colors and designs and potential to once again cause a battle between the hordes running to Milan to possess the brand’s plain and simple utilitarian techno-nylon clothes, the cashmere V-necks and everything else they can get their hands on, as was the case in the ’90s. Some of those old favorites are pulled into the 2015 styles as well, though a new direction seems to be opening up if the blue-red-white tartan coat at the end of the collection offers any information. It’s exciting to see what comes next! There’s something very masculine about the way the modern recreation of a high school student’s uniform would be like, with an untucked shirt in a professional blue hue, a midi skirt in pleated black and a long knee-length jacket to cover it all up. The bag is large and could easily carry books, while the shoes are certainly nothing fancy, shiny and black and very school-worthy. 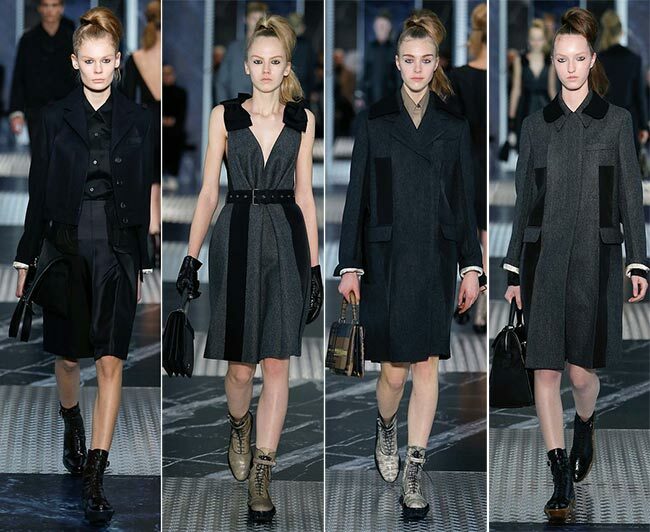 There’s nothing particularly chic about the look but it is simple, dark and utilitarian, entirely in harmony with the Prada tastes. For something more coquettish, a little more on the pretty side, but still reminding us of a tomboy trying to dress as a girl, the deep V-neck pleated gray dress with a midi length hem and buckled belt is actually a rather awesome piece for girls like me who enjoy the less than feminine but not quite masculine designs. The shoes are for comfort more than for style it appears, but that are certainly not ugly in the least. The gloves bring a more feminine touch, while the little back will probably to be able to carry much in school products unless we plan on working on tablets. 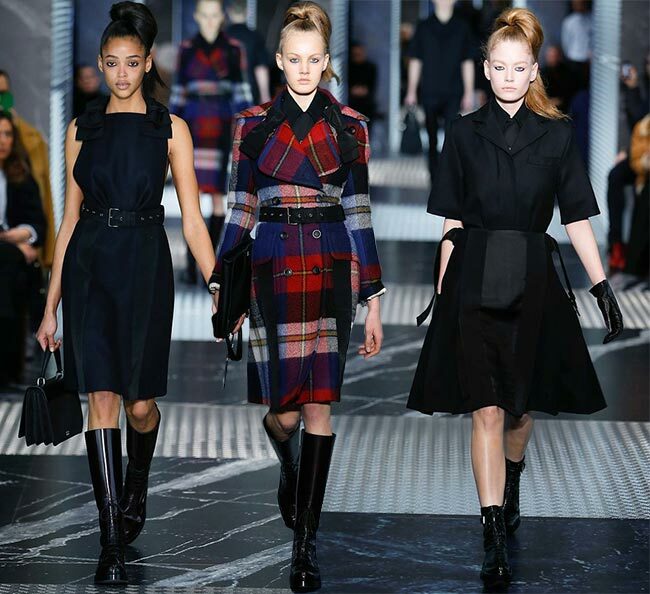 The red, blue and white tartan coat offered the only bit of color in the whole of Prada pre-fall 2015 collection, with the buckled belt and black shirt underneath keeping to the pre-fall collection’s general theme, while the knee-high boots and French colored designs pointing towards what may be coming up in the future collections. 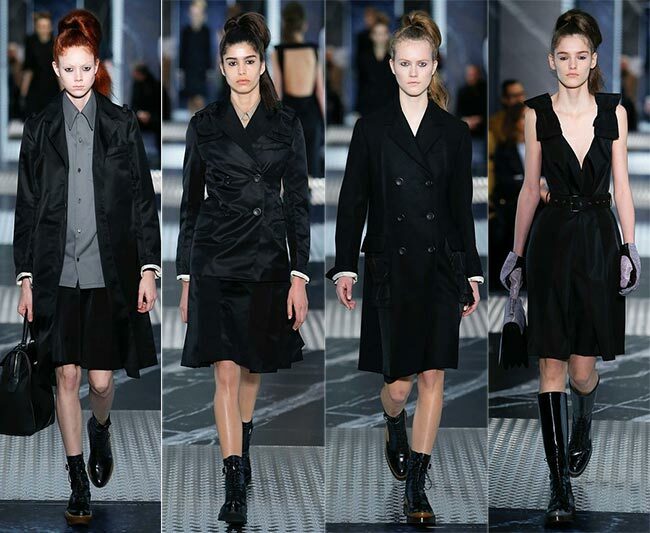 The hair is tied in a high ponytail, but there’s something quite appealing about this look that piques our curiosity. It’s certainly a piece worth adding to the pre-fall wardrobe this year and perhaps we’ll be able to keep wearing it into 2016, should the tartan look suddenly become a prominent design for Prada’s upcoming lines of products.